Foam floor tiles are individual pieces of foam that are placed on the ground to create a softer and/or more attractive surface (Source). They are often used in children’s bedrooms or play rooms to create a good, soft area for children to play. They are also quite often used as a good surface for exercising or working out. In a set of foam floor tiles, each individual tile has edges that are made with grooves in them (Source). They are all designed to fit together like puzzle pieces. They are also designed so that you can decide the size of the foam surface that you want. One buyer said that they were able to use their foam floor tiles to lessen the amount of noise they were causing in the apartment beneath theirs. Other buyers suggested using something like duct tape on the underside of the tiles to keep them together easily and prevent little ones from pulling them apart. One of the big factors of choosing what foam floor tiles will work best for your space is appearance. 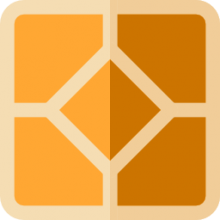 There is a nice variety of foam tiles on this list including options that work great as foam mats for kids or baby play mats as well as ideal looks for floor tiles for bathrooms and floor tiles for kitchens. The ProSource foam floor tiles have a nice industrial look to them with a great non-skid texture making them the best floor tiles for working out. 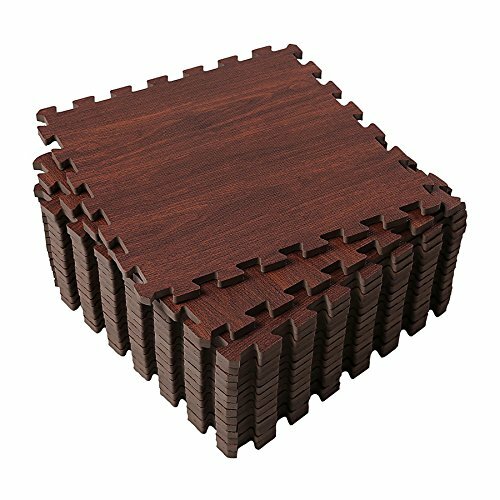 Both the Forest Floor interlocking foam tiles as well as the Superjare interlocking foam tiles have a sophisticated wood grain pattern to them which gives them the ability to match well in any space you want to put them in. The Skip Hop and the Poco Divo foam floor tiles are ideal for children’s rooms or nurseries. Poco Divo’s foam floor tiles are playfully colorful, and Skip Hop’s interlocking foam tiles have a lovely grey and cream pattern that will match well with any color scheme. Skip Hop’s foam floor tiles also have a unique triangular design that allows you to place them in many different patterns including a chevron pattern or a checker board pattern. Superjare’s foam floor tiles as well as the Poco Divo interlocking foam tiles are each 1 square foot, while Forest Floor’s and ProSource’s foam floor tiles come as 2 square feet pieces. All of the interlocking foam tiles on the list include borders to give a nice finished look, other than Poco Divo’s foam tiles. Superjare, Forest Floor, and ProSouce all have foam floor tiles that are water resistant as well. The ProSource foam floor tiles area good option if you are looking for a protective workout flooring that will provide excellent support and cushion. Users like the quality of the padding of this mat, but do complain about the incorrect product description. 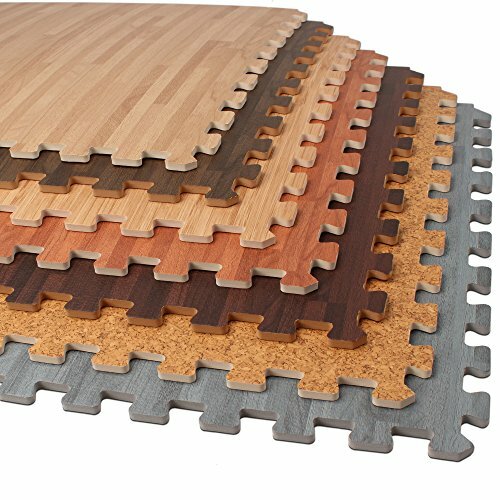 These lightweight puzzle pieces connect and disassemble quickly and easily, creating a non-skid textured protection for your floors, while at the same time creating a comfortable workout space. They are made of a high-density EVA foam and contain no toxic phthalates. The item is available in three colors (black, blue and grey). This exercise puzzle mat seems like a good choice if you want a comfortable, durable surface for workouts and exercise equipment. The general user consensus concerning the ProSource Foam Interlocking Tiles is that they are perfect for a home gym.Users praise the good quality padding and the fact that the mat is great for lessening joint impact when exercising. However,buyers complain about the product description which significantly differs from the product label, in the sense that the item is advertised as not containing phthalates while the product label says otherwise. Some users complain about the foam being too thin and flimsy, as well as about the pieces breaking apart when doing jumping jacks and other jumping exercises. The POCO DIVO Foam Tile Floor Mat is a solid option for a playroom, exercise room, daycare and school.Users like the versatility of this foam mat, but do complain about the size. This colorful high-density EVA foam mat is soft and durable. It is non-toxic, tested free of lead, BPA and phthalates. 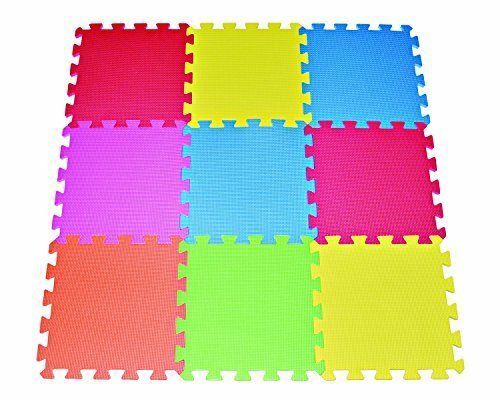 Thanks to the innovative interlocking attributes, these foam tiles can also cover the wall around the kids’ activity area.These multi color foam floor tiles could be a solid choice if you want not only to provide the protection and fun for your children, but also help with their visual sensory development and hand-eye coordination. In general, users have a favorable opinion of the POCO DIVO 9-Tile Multi color Exercise Mat.They agree that it is durable, convenient, versatile and affordable.Satisfied buyers recommend it for blocking knitted items since it does the same job for a lower price. However, buyers complain about the size being too small. Therefore, they suggest placing the order for two packages since one is really not big enough for a play area. Some purchasers complain about the mat being really thin, flimsy and not fitting together well on the corners of each piece. If you are looking for top-rated flooring mat tiles, you might want to consider these offered by Forest Floor. 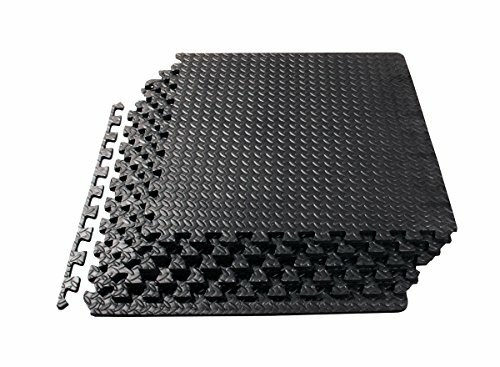 Users love the usefulness of this foam floor mat, but do complain about it changing color and texture if exposed to the sun. These foam tiles come with two free borders. They are made from resilient, non-toxic EVA foam, and are lightweight, durable, scratch- and water-resistant. There are 6 laminate wood, cork or bamboo prints to choose from. These interlocking foam floor tiles might be a good choice if you want to cushion hard floor surfaces. In general, users have a favorable opinion of the Forest Floor Interlocking Wood Print Foam and they agree that it looks great, as well as that it is affordable and practical. They find it to be a great way to convert your basement into another room. However,purchasers complain about the top layer discoloring and peeling off if exposed to the sun. As they say, the mat is indeed beautiful until it bubbles and warps in less than five minutes of sunlight. The Skip Hop Foam Floor Play mat is a solid option if you are looking for a stylish baby-safe flooring that will complement your home’s decor. Users like the looks of this foam mat, but do complain about two shades of white-colored pieces. This product features 40 triangles, 32 edge pieces and some extra edge pieces, which allow you to create multiple designs and custom sizes. 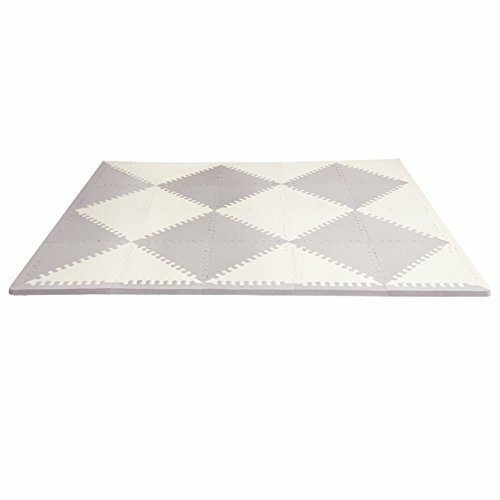 These play spot soft-foam triangle tiles connect easily to create trendsetting patterns for the ultimate customization for your little one’s play space.This item could be a solid choice if you are looking for foam floor tiles in soft, light grey and cream colors to complement any nursery. In general, buyers are pleased with the Skip Hop Geo Grey-Cream Foam Floor Tiles. They appreciate the versatility (you can switch up the patterns) and durability of this mat. One happy buyer shares that it is soft enough for a baby to take a tumble. However, some buyers complain about receiving the item with two different shades of white (one being white and the other ivory). Some users also complain about it being too hard, almost as a wood floor. One dissatisfied buyer states that every time her son plays on it there are divots left in the foam and it’s no longer an even surface. If you are looking for interlocking foam floor tiles, you might want to consider the SUPERJARE Protective Flooring Mat. Users like the cushioning of these foam floor tiles, but do complain about the poor quality material. This product includes 16 tiles and 32 end borders which are made of high-density, non-toxic EVA foam. The outer edge of the mat can be removed so that more interlocking tiles can be added anytime. You can choose between the dark and light wood grain color. If you are looking for a foam mat which will protect your spine, hips, knees and elbows on hard floors and at the same time protect floors from damage, this might be a solid option. In general, users are happy with the SUPERJARE Interlocking Foam Tiles. They like that they give an impression of a wood-finished floor and yet are comfortable to stand, sit and play.Users conclude that this is an excellent floor for kids to play on, as well as for anyone who needs to stand on their feet for long periods of time. However, some buyers complain about the flimsy and not very thick material.Several buyers complain about receiving the tiles with waves and mold issues, as well as about a strong smell. In summary, having reviewed consumer experience with interlocking foam mats, we see that they have a variety of commercial and residential uses. They can function as cushioned exercise tiles, portable tradeshow flooring, a soft fall mat for children's play rooms, and even flooring for martial arts studios. Since they interlock and are pretty customizable you can install them in differently shaped areas and find an exact fit. That means that you can get them installed on your own in your home garage, basement, tool shop or exercise area, ensuring a safe and comfortable flooring with even some decorative aspects, as well. Indeed, you'll want to cruise the Internet because there are a variety of different styles available- economy-model interlocking tiles, extra thick and reversible soft flooring tiles, faux wood tiles, faux carpet tiling, and interlocking foam tiles with baby-themed designs. We often resort to Pinterest, searching through different pins to see what users have created to generate inspiration.